At first, I had booked my flight from Paris to Iceland, with a layover in Copenhagen. It was my first trip with a longer layover, six hours. My friend Bekah suggested I sight see with my time one Denmark. After a little bit of research, I found out there is a ten minute light rail into the city from the airport. Since I wouldn’t have my luggage, I figured it was worth it to go investigate a new country, and at least have some non-airport food. It rained from the moment I stepped off the plane. it is amazing how little the weather matters when you are someplace new. Walking through the airport, I was already enameled by the little painted elephant sculptures that seemed to be escorting me to the light rail. It turns out there was a city wide art installation known as the Parade of Elephants. It has been hosted by many other cities, and the next one will be in Belo Horizonte Brazil. The city itself has a long relationship with Elephants, as the Royal Family created the Order of the Elephant, a designation reserved for citizens who exemplify the best of Danish culture. I have read up on the history of this order, but with no real explanation as to why elephants, or if they had elephants, or any answers to my questions. As soon as I exited the light rail, I was already deeply disappointed I would not be spending my layover sightseeing on a bike. The incorporation of bike lanes on the roads was apparent immediately, with separate and designated bike lanes that were wide enough to accommodate the large number of commuters. They additionally had separate traffic lights for the bike lanes. 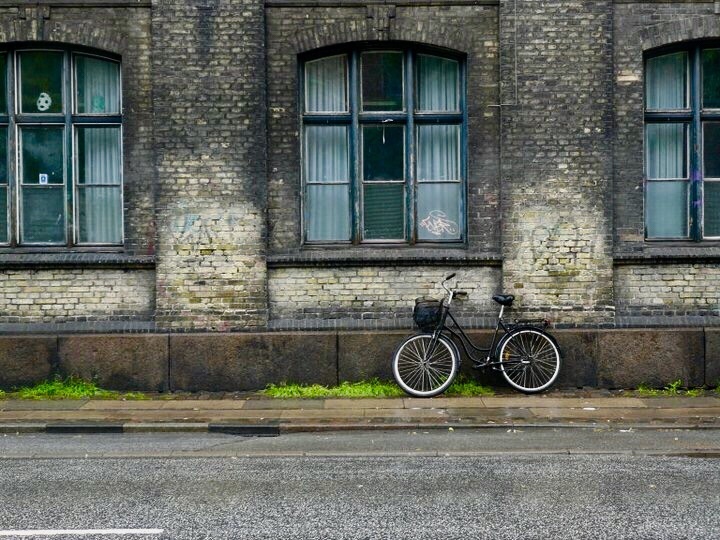 I read that about 35% of all Danes commute via bicycle daily. I set out on foot, I was on my way to the area known as Christiana Free Town. An independent area located in the eastern most section of Copenhagen, it sits on the waterway known in English as the Sound, which is one of the waterways connecting the Atlantic Ocean to the Black Sea. Across the Sound, (known as Øresund in Danish) is Sweden. My friend Bekah had informed me I had to see Christiana Freetown, because it was a sort of artist community, and that I would really enjoy it. I didn’t do much research before arrival, as sometimes I like to just fly by the seat of my pants. Christianatown is extremely unassuming from the outside, being surrounded by a fairly low brick wall, with some shadier characters milling around an entrance. Once inside the front entrance, I found a small coffee shop, and upon entering was greeted with an exuberant “HALLO!” from the girl behind the counter. Eventually, with the lack of affordable housing at the time, artists, squatters, anarchists, and others moved onto the land, using it however they best saw fit. Unfortunately, one of the most infamous parts of Christiianatown is the open air drug market in the center, which upon entering from all sides has big signs prohibiting pictures. It isn’t much to see, and even I who enjoys smoking pot, felt like it was even too seedy and weird for me. Although, I know plenty of people who have partook, and enjoyed themselves, I only had a few hours and still much more to see. I toured the rest of the grounds, seeing murals, studios, a bike shop, a convenience store, a trading post, and people watering plants and going about their daily business everywhere. I liked it. Next, I was off to the main shopping area to investigate some Danish design. I liked the houses, next to the water, and I imagined as I always do what it is like to be part of a long family history of sailing, or just daily life with the sea. There are canals and waterways all throughout the city. The shopping street was unremarkable to me with the exception of the LEGO store. So I got to the end and decided to take another street that ran parallel to it back, and found exactly what I was looking for. Every building had a small shop, gallery, or workshop in every window. There was people making things right in front of your eyes, the very things they were selling in their stores. I wanted to step inside and ask each on of them to tell me more. One man was even drinking a beer as he worked, and I respected that immensely. Leather working, sewing and fabrics, jewelry, pottery, this street had every craft. I didn’t get to see the Little Mermaid, or the fantastic bridges, or the planetarium or the Art museum. I know I will be back one day and I look forward to it. There are much worse ways to spend a layover.